Great thank you tag to attach to bottles. I got different string that was easier to handle. The white string that was included was just OK and very fine. 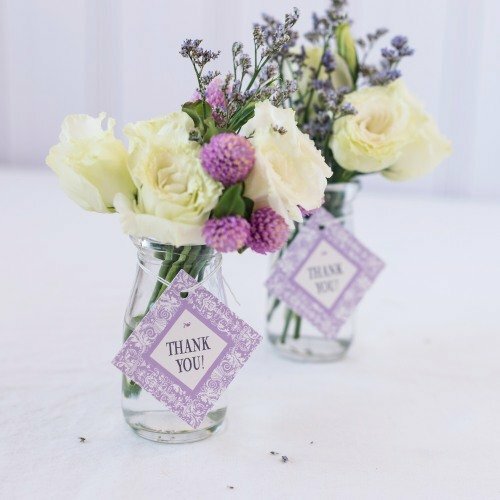 We used them as a thank you tied on to a wine bottle turned vase that was painted white with burlap ribbon and bling on the front, with a purple carnation as a take home for bridal shower guests. There are absolutely no complaints. Fast ship, and oh so cute. We chose the burlap and lace that went with the shower theme of shabby chic. Thx so much. These fans were a hit among guests, lightweight yet sturdy, and most importantly functional! When I ordered the mini Palm trees I thought about ordering these tags and ribbons. Boy I am so happy I ordered them. They are really attractive with the ribbon and enhance the beauty of the mini palm trees. These tags are perfect to use for my wedding favors. They will be tied around the top of white lanterns. The customization came out amazing!! I was really impressed with these tags. I used them on wedding favors and loved the way they looked. They are sturdy, unlike some of the other brands, and hold up well. I ordered these tags in a fuschia design and tied them on bud vases (also from Beau-coup) that had a fuschia silk gerbera daisy in them. They were easy to tie onto the vases (you do have to put the strings in the hole yourself; no biggie) and looked really cute. I am not handy with graphics on my computer, so ordering these was great. There awesome! Can't wait to use them! I bought the sandalwood fans to place them on as suggested so I hope they fit perfectly. The fans will be used as wedding favors and these tags will be used to show people exactly who's wedding it was for. I love the color options. Perfect for bridal shower favors! These tags were bright and colorful. Worked perfect for bridal shower favors. Reasonably priced. Personalized gift tags were great!! We tied these on the bridal shower favors and it made them uniquely special. Nice keeper for the photo albums, too. This product is so affordable for the amount of tags you get< I used it for both my gift favours and wedding cake boxes. It was much more versatile that personalised ribbon, as you not know how exactly the ribbon would be utilised but it was easy to add a tag through any small surface. 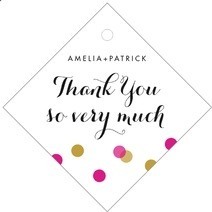 Just an example to let your guests know that you took a little extra thought in their "Thank You" gift with these professionally looking tags!! I wanted something a little different and these tags were perfect and added just the right touch. They matched the little bags and I was so pleased. Wonderful to use as a final touch on any gift. Very nice product. They were perfect for the wedding favors that we had purchased... Thanks! I bought these to put on the gift bags for the out-of-town guests for my son's upcoming wedding. The bride and groom thought they were adorable. I will write the name of the guests on the back. I also bought the personalized satin ribbons to tie the bags closed. I added personalized lip glosses and the small candy tins to put in the bags, also. I think the guests will like their gift bags. I used these tags for party favors. We used curling ribbon and tied these to bangles for our Bollywood bash favors! The tags were personalized and used as part of favors that were given out at a fancy event. We tied this product on to our wedding favours (maple leaf shaped maple syrup bottles) we bought light blue ribbon and the tags were the perfect personal touch. We bought this as a finishing touch for our wedding thank you gifts. We received the product and were very happy with the quality of the tags and how good it looks on our gifts. These tags are just perfect for gift bags! I used these tags on the organza bags. It was perfect and added a little extra to the favor for my friends shower. The tags are super cute! They turned out great! Also a nice price fir the quality ordered! I used the tags for that "wow" detail on the bridal shower favors for my future niece-in-law. A very attractive way to include not only the bride and grooms first names but the last name initial was artfully done. These were used for my son's wedding.Just enough to let someone know,appreicate and remember any event. Not over powering or over done. Absolutly perfect, exactly as I wanted. To finish wedding gifts to thank the guests. Perfect finishing touch on our lace bags filled with goodies. Bought delicate lace to tie them up instead of the cord that came with it for a better delicate touch.Thank you so much quality item, great price and the service was terrific and quick delivery as well! I used these for my bubble wands for my wedding ceremony. they were JUST the thing it needed to look amazing! We purchased dark chocolate fudge for party gifts for my daughters wedding and we customized the tags to include a thank you from the bride and groom! The tags were perfect and added a nice personalized touch to the gifts. We tied them on with jute and ribbon and received lots of wonderful comments. The small size (diamond shape) tags with the bride and groom's names are the perfect size for the favors I had already purchased. They really shine against the pink favors. I only wish the tie-ons were of ribbon quality and not embroidery thread, but I can change that. Thanks again! These were perfect to label my homemade olive oild for my wedding favors. 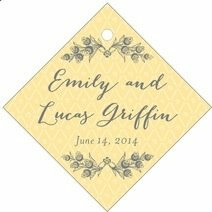 I ordered these gift tags with the bride and grooms names and date of wedding. These tags were supposed to be attached to the Starfish Wine Stopper Party Favors. The tags were quite small and difficult to read. Next time, I would order the larger tags as a means of personalizing the gift to family and friends. This was the little detail that was added to the brownie pops. A perfect wedding favor. All guests complimented and was the finishing touch in thanking our guests. The tags had the antique/lace design. Perfect! I was very pleased at the quality of the favor tags and the colors were great! Perfect, exactly what we wanted. Putting the tags on Mini Plams, then using the plams to decorate the tables. Very Pretty and Nice Quality! Sent me more than I needed at no additional cost. Great buy! Added these tags to bridal shower favors to give them a more personal touch. Nice selection of styles and colors to choose from. Just what I was looking for! 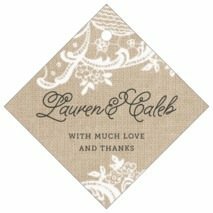 I ordered these favor tags to place on burlap bags (also found on beau-coup.com) of seeds for a garden-themed bridal shower. The tags are of sturdy cardstock and are true to expected color. I chose not to use line 2 of text for a cleaner look and the tags were easy to read from a distance. Printing is very clear, no smudging. I ordered the 2" circle Metropolitan tags in butter yellow, and though other reviewers were disappointed in the size of their tags, mine are Precisely 2 inches in diameter. The tags do not have a shiny surface, as the sample photo might lead you to believe. 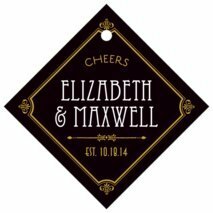 I would appreciate the ability to upload a pdf design of my own to be printed on the tags that would increase the colors/designs available and allow the tags to be a more cohesive part of the shower/wedding theme. Customer service worked with me closely to make sure I would be happy with the final product and was very responsive. Within 8 business days I had the completed tags in my hand - withOUT using rush shipping. Thank you!! I use this product for my daughter's bridal shower. The tags displayed her name and date of the bridal shower. They were perfect. I loved the design. We used the personalized tags on our wedding favors. There was such a variety of colors to choose from and designs we could really pick a style that best suited the theme of our wedding. They came quickly, with no errors and were more durable than expected. They were the perfect size for our 2x2 favor boxes. They added a nice personal touch to our event in a simple yet elegant way! I would definitely recommend them as they can be truly personalized. Perfect size for favors, fabulous!!!! Ideal for small favor, its the perfect size!!! I ordered these for my daughter's bridal shower. They fit perfectly on the favors. My daughter loved the design. We got lots of compliments on how great they were. I used these for party favors for my daughters Sweet 16 party favors. I should have ordered a little bigger but the worked out fine. The delivery was very fast. got them in no time! I purchased these to add to my daughter's quinceanera favor and she not only loved them but her guests thought they looked perfect. My daughter's friends thought they were adorable and the tags certainly fit her desire to depart from her pre-adolescent party themes of her past to a more grown up feel. Her initial in the center of the "Thank You" just added that extra little touch. Tags came out great and looked wonderful on our favors! I used this product to dress up Jordan Almonds that I put in organza bags. It was the perfect way to add an elegant touch and not overpowering. Will add a nice touch to the favor boxes for my daughter's wedding. Everyone likes to see their name on a tag! The birthday girl and the guests were so impressed that the gift was especially made for the guest of honor, and every lady loves a cosmo. It's all in the presentation - a gift can be small but when it's beautifully wrapped people go wild. I used these black filigree tags with black satin ribbon with apple green ribbon and they made the package very special. Just perfect for what I had in mind. Hit of the party. Very helpfully, products arrived fairly quickly. The chat specialist are great. I couldn't be happier with the tags! Great !! Will Buy This Again. 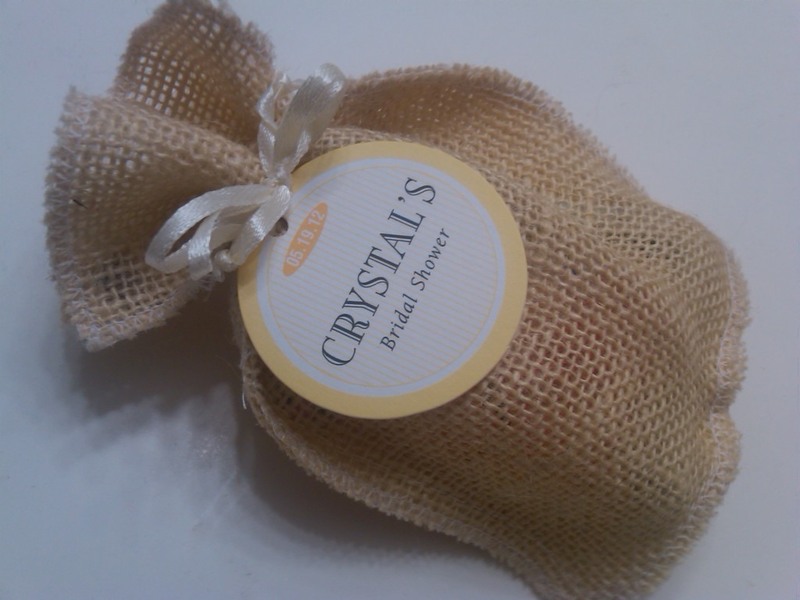 The product was used on favors for my daughter's bridal shower. The design was beautiful, the lettering and spacing of the words was just right. Best of all was that the product offered colors that matched my daughter's wedding color scheme. the quality! These tags really enhanced the party favors and were well worth it. YOUR OWN RIBBON NOT STRING! 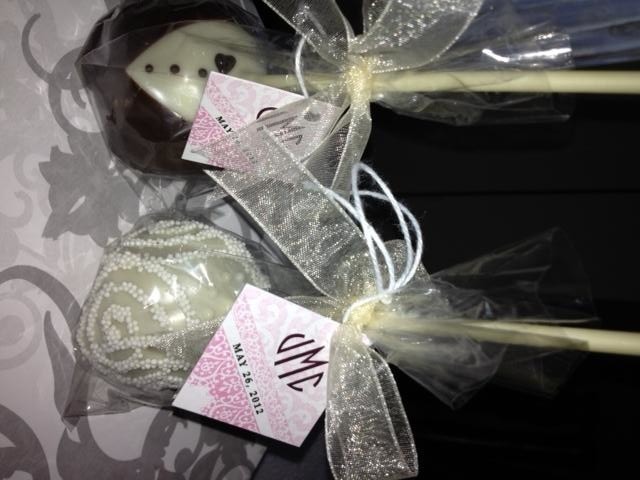 PERSONALIZED TAGS REALLY MADE THE BROWNIE POP SPECIAL BUT WE ADDED OUR OWN RIBBON TIE, NOT THE STRING PROVIDED AND IT MADE ALL THE DIFFERENCE. BUT DEFINITELY, PERSONALIZATION IS THE WAY TO GO. I tie these to organza bags and ship to my customers. It's a great, attractive way to advertise your business. Wonderful tags for BFF birthday favors! Ordered the oval black and white tags. They worked perfectly for the 'bling' birthday party we had for a 40th party to attach to bracelets and used as a napkin ring. The printing looked so nice and professional and the price was right! When I first got the tags I wasnt impressed so I ordered stickers only to find that stickers made the truffle boxes look cheesy! The TAGS were actually a perfect match. Do not get the stickers! They're horrible. I loved the gift tags. They looked beautiful on all my gifts to my guest. Will order again and have added you to my vendor list for future events. The words, "A measure of friendship" is perfect. The tags are attached to measuring spoons for friends who have shared recipes through the years. A great Christmas gift for them! These tags completed my gumball machines. Perfect fit. My favor was complete as shown in the picture listed. Completely satisfied with the favor for my rehearsal dinner. I would order these tags again. Nice!!! I used these gift tags for Bridal Shower favors and they looked great! The only problem was that there was not enough room for the wording I wanted. All in all, I was very pleased with them. They were very pretty and added a personalized touch to the favors. I would definitely buy them again! I purchased these tags to put on fans for wedding favors. The colors were just as indicated and the print quality was good. The tags were smaller than I expected, although they told me the size in advance. Suggest ordering the larger ones. This tag was almost a 10. I used this tag on my bridal shower "giveaways". It was cute, just the right size, & the color was dead on. Only problem was my name was quite small & the text was a standrd text. Most of my guest's didn't realize my name was even printed on the tag. Overall a good buy! 9 out of 10! 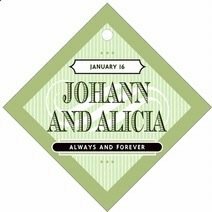 GREAT PRODUCT, I REALLY LOVED THE LABELS, EXCELLENT QUALITY, COLORS LOOK GREAT, I'M GONNA USE THEM TO TAG SLIPPERS THAT I'M GONNA GIVE AWAY IN MY WEDDING, I THINK IT'S A REALLY NICE TOUCH AND ARE GONNA LOOK GREAT THAT DAY! 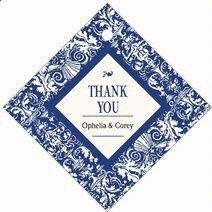 Used it to add personalized thank you message on the organza bag with favor cookie inside. I liked the bright color and design which added a kick to the boring white organza bag. A little smaller then I expected, but great for the price! Just added the right touch or our wedding favors! Tag for my son's communion favors. Beautiful simple yet elegant style. used this tag with the mini palm,the slide ribn, an gold metal cross for my childrens' communion. With alittle trial and error<I was able to use the string provided with the tag to tie the gold cross at the end of ribbon. after you pull inner strings of ribbon pull the tag thru and everything falls into place!!! Use the hanging ribbon to tie the whole thing around the favor!! This was used to place on the Japanese Incense set. Made a great Party Favor. At a fundraiser for Belleglen Sanctuary for Cats, we attached these 'name tags' onto ribbon collars onto stuffed toys. The look was very professional and polished and added a special touch to our stuffed kitties. Really a wonderful accent. We will be reordering. I AM CUTTING OFF THE TAGS TO A TEA BAG AND STAPLEING THESE TAGS ON, AND PUTTING A TEA BAG IN MINI TEAPOTS,WITH THE TAG HANGING OUT WITH HER NAME ON THEM..IN A CELLO BAG TIED WITH ORGANZA RIBBON, CAME OUT BEAUTIFUL !!!!!! I'm using these as tags for a line of t shirts I design so not exactly the intended use. Figured I'd give it a try [...]. Well, they showed up unbelievably perfect for use as clothing tags so I'm pretty happy! An extra "wow" to my party favors! 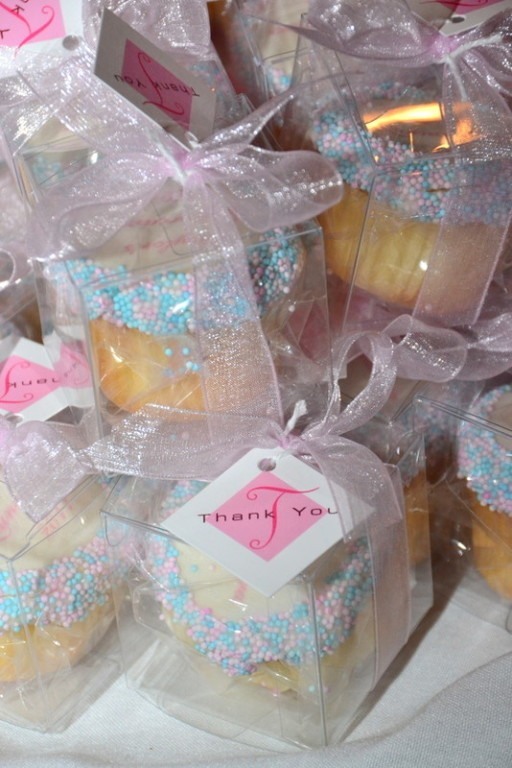 Anytime you add a personal touch to a party favor goes over well! I used this little tags to personalize and thank our guest. They were placed around the tiny vases with ribbon, and the vase was filled with sweet peas. They made the perfect bridal shower favor! So Happy With These Tags! These tags are great for the favors I have in mind for my daughter's wedding in August! They are really nicely done and so professional-looking. I am so excited to finish assembling the favor bags! Thank you, Beau Coup! used these labels on the mini palm trees as bridal shower favors. Product is great but very tricky on attachment! My gift box favors will be incomplete without these tags. I just love it! These tags are the perfect addition to our bridal shower favor; coordinating with the fall soaps they are great. We used them as favors for chopsticks for our Buddhist Womens luncheon. The luncheon took place in a tea room and the favors just added to the flavor of the get together. [...] Your products are great [...]. I bought the round labels to put on the top of mini assorted candles. They fit perfiectly and also added a personal touch that everyone is sure to love as a favor. Filled chinese carry out boxes in wedding colors from Beau-Coup with sweet treats for bridal shower favors and added personalized tags that said (the bride's name) thanks you for the sweet beginning. Can't wait to share them at the shower being held at an Asian tea room. 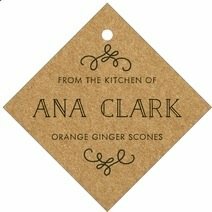 These labels came out perfect for my product.Just plain lovely! I purchased these tags to use on some favors for a 50th birthday celebration. I was very pleased with the tags when I received them. The color and quality of the tags was great. Also when placing my order I was not sure which size or shape to order but after speaking with someone on the live chat they were able to make suggestions that was very helpful. Overall I was very pleased with the product. I Am a Repeat Buyer! I ordered last Summer for our Daughters Beach Wedding Favors, and am now Planning a Baby Shower! What a Wonderful Personalized Accent for your Guests....I Highly Recommend this Produce! The tags add a special touch to gifts--they make them unique and thoughtful for the recipient. I added the tags to the mini gumball machines for my son's goodie bags at his birthday and they were a big hit! These gift tags were perfect and I was happy to be able to choose the shape and design. It made my gift bag flawless. 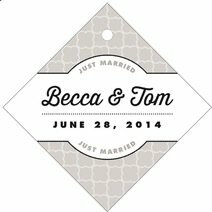 These tags are a cute and easy way to personalize our gifts for our wedding party. They weren't very expensive and it gives our gift wrapping a special touch. Love them! I tied these on to the two-tier mini cakes and they just took the favor up a notch to AWESOME! Such a great way to personalize an already great favor! Liked the tags, did not care for the strings they sent. We used the small gift tags for small glass bottles used for bluebonnet seeds as wedding favors. The tags were a perfect size and looked great! I would definitely recommend these tags. I used them as favor tags...Its great because of the size & design options...The thing that isn't as great is that it quality and its delicate may rip as you tear them apart. These little tags were the perfect touch to add to the wedding favours we also purchased from Beaucoup. The colour & size were exactly what I expected. We added these gift tags to small bottles of syrup we gave out at a trade show... they look great! For me these gifts tags were well worth the price and saved me the hassle of having to make the gift tags myself. I just wish they were a bit bigger, but the quality and choice of fonts/designs are good. ADDED THEM TO THE BABY SHOWER FAVORS,WERE SO CUTE AND A GREAT WAY TO LET EVERYONE KNOW THE BABY'S NAME. 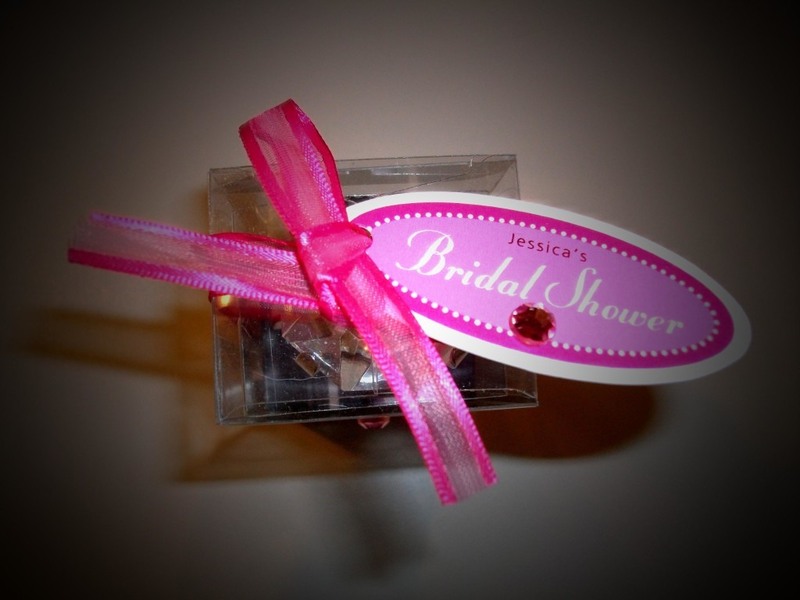 Eye-catching addition to shower favors! 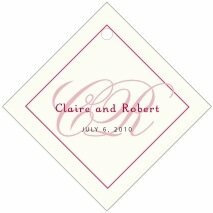 I had oval tags printed with "Love Is Brewing" and the names of the bride and groom. 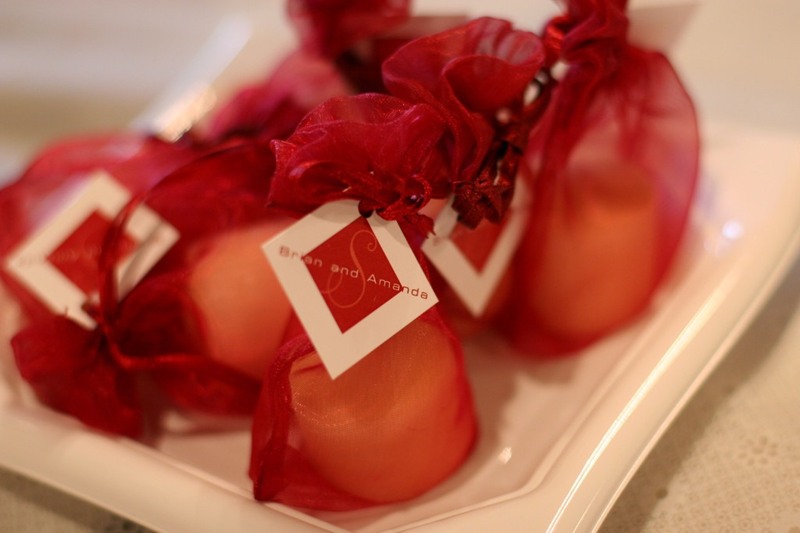 I tied them to heart-shaped tea infusers as favors at a teaparty bridal shower. Perfect for wedding and shower favors. Great way to make things your own! These were so cute on my favors and they came apart much easier than some tags I ordered from a different company I say this because they come in a sheet and they come apart. 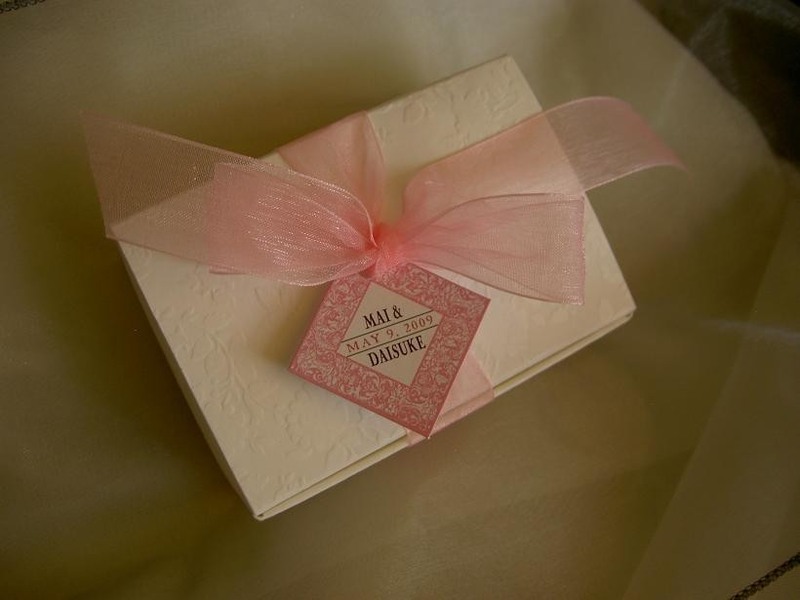 The diamond-shaped favor gift tags worked well tied to a ribbon wrapped around a 4x4x2" box used for a favor. The oval "For our Guests" tag was perfect for the Guest Bags. They even came with pre-cut string. The tags were simple but elegant. I ordered this product to be put on lids for the homemade Jam wedding favors I am making-the only thing about this product is I thought they would be a little bigger-but not a big deal :-) They look very nice & elegant so I am very pleased....Thanks again!!!!!! 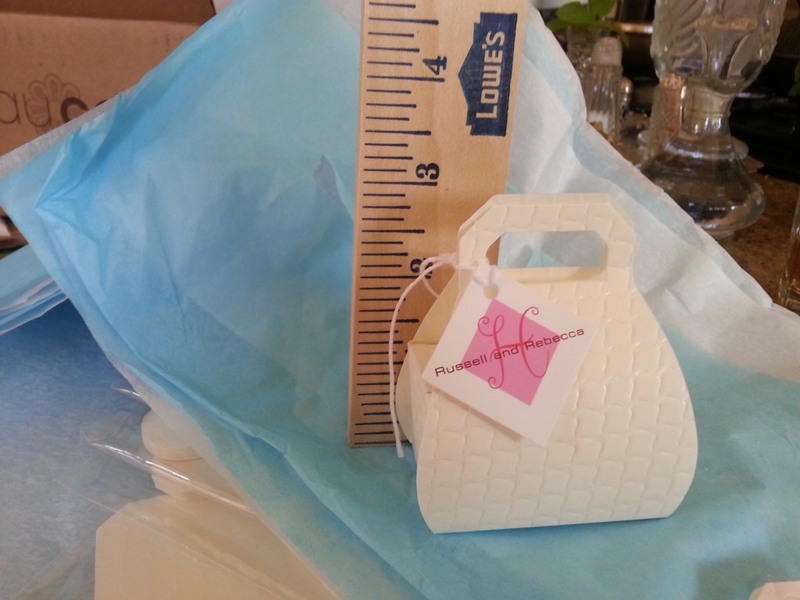 These are the perfect size as favor tags for the mini-lanterns. They match perfectly with my wedding decor. Excellent addition to any shower gift or favor. I was disappointed however that not all designs were able to "hold" wanted text. Big Fan of these tags! I've ordered these tags for 5 parties...different designs and never been disappointed. Great gift tags with several amazing designs to choose from. I wish though that the gift stickers matched the gift tags so you could buy both for an event. The tags went on bags of chocolate shells for bridal shower favors. We got a lot of compliments on the favors and the color matched the other shower decorations. We used silver twist ties to attach the tags, which kept them in place, then added a ribbon. They were so cute. Perfect size, perfect color good quality for small gift tags. This item was exactly as pictured. I bought these tags to tie on the favors for my daughter-in-law's bridal shower. They were well done, and exactly as pictured. I purchased these gift tags to use for my wedding favors. I looked at many different websites and compared prices, while Beau-coup was a little more expensive then others they had the best reviews and options. The gift tags are beautiful and will work wonderfully on our favors. Personalized these for a 50th birthday party with "50" in the middle and Happy Birthday Susan. The quality is great. They came with strings to tie with but I was able to thread my ribbon through the hole to attach to the favors. I ordered the tags for bridal shower favors for a very good friend. They looked perfect! These were absolutely adorable. I used them for my engagement as tags on gift boxes. I was looking for something to personalize my favors for my wedding, and I found these tags. These are absolutely classy, and I love that they are personalized. I think it adds a nice touch to all my favors so that my guests know how happy I am that they can share my wedding day with me. They looked fantastic but where more than half of the size I was picturing based on the sample pictures. Way smaller than I expected. I attached these to my fan favors at my destination wedding. They worked perfectly! These were used on the miniature alcoholic beverages I included in the goodie bags. They added a little personalization to the gifts as if they were from the birthday person. Didn't hurt that it was attached to a bottle of alcohol either. 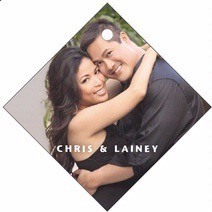 This was a very classy label to use on our engagement favors. Legible and pretty, and matched the theme of our party. This is an overall good, practical product. I do wish that there were more labels for the price they go for and there were more design options. Overall I would purchase this item again. These were great. I've bought them twice and no regrets. Make sure you see how many tags per page. It varies depending on the shape of your tag. I used this product as a "thank you" card which was placed on my birthday favors. It was decorative and added a classy "thank you" to go along with the favor. I used the bigger of the sizes, the smaller size may have been too small for my use. I used the tags on favors for my daughter's 1st birthday party. They were beautiful and my guests loved them! very cute! The tags made the difference between simple wedding favors and special ones! Great design, great color options, good size and very easy to manage. I wish all of them could include two lines to put the date. We bought oval tangerine and gold and they look great! 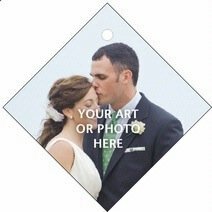 I ordered these tags to attach to individual fans we ordered for our duaghter's July wedding. They [...]were just what I expected -no more, no less. It personalized the fans and added a special touch. I would order from Beau-Coup again. Was nice but too light. background design was too cofusing. i thought it was a waste of money. I Love them! I would order them again! I used them to create favors for my son's wedding. Mini bottles of wine tied with ribbon and the favor tag, made a practical, but yet special favor. I also used them to create gift bags for the bridal party - they all love them!! Tags come in very pretty designs and are a nice finishing touch to any favor. The one thing that I would suggest is that you select one of the more basic fonts if selecting a small tag. I used a script font on a fairly small tag and it was a little difficult to read. These favor tags were great! I bought these for bridal shower favors and they were great! I got the smallest ones - the 1 and 1/4 inch squares and the size was great (I used them with the 3x4 inch organza bags). I was very happy with how it all looked! Our gift to you!! Thank-you!! I used the little tags on coffee mugs, as favors for my daughters wedding.Everyone thought it was great!! The labels were as attractive as the picture represented. We only wished that they weren't tie-ons, but had adhesive backing instead. The white ties that come with the labels really aren't very nice, so we'll use pretty embroidery thread to tie the labels to our gift bags. I used these on bottles for rehearsal dinner favors. They added a personal touch with a ribbon and were colorful and noticeable. Lots of choices also. I tied the tags to lanterns for a wedding, they turned out really cute! Loved the tags....great addition to our wedding gift bags...I should have ordered a bit bigger print, tho....otherwise very nice!! Awesome custom tags for my wedding! These were gorgeous and added a beautiful touch to the my "message in a bottle" wedding favors. I am so glad I made the choice to order these! I used the tags on my wedding favors and they look wonderful. The tags came in quickly and exactly what I expected from the designs shown on the website. Great quality and very affordable. 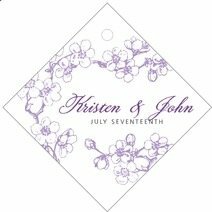 I ordered these chic little labels (in lavender) for my sister's bridal shower. They were the final touch to the decorations, which her friends raved about. I made favors out of the little chinese takeout boxes filled with matching m&ms, which were left on each person's place setting. The labels were tied on with a simple matching ribbon. I had extra labels, so I decided to also tie them to the bamboo plants (centerpieces) using the same matching ribbon. My sister really appreciated the little personalized details. Great idea at a great price. Easy to do point-click business with company. They were exactly what I expected from what I saw online. They will work perfectly with the boxes that I ordered. I thought that these tags were excellent quality and had a beautiful design which I appreciated even more when I received the final product. I was a bit surprised at the color, which was a green much more dull than it appeared on my screen (and much more dull than the other products I ordered on this site). I am also still confused as to why the designer who phoned me insisted that she reverse the order of my text and put the first part after our names. The text was all inside a square box and she said that the words wouldn't fit but that doesn't make any sense? If I ordered again, I would simply try to order enough in advance to make two orders- a test order and a final version. Was not able to sue it due tpo it shipped late. My neighbour signed for it and gave it to me after the wedding. Very good design and print out but I would like to have hd the option for thicker paper. We used the product for an anniversary party for our parents. We were able to use the gift tags both to personalize the favours for the event -- and also as place cards. The labels were beautiful but overpriced, especially compared to the boxes I used them on. Cute!....But Monogram was not centered. The name tags that I ordered had our monogram behind our names. Everything looked great except for the monogram. It was not centered and made the tag look a bit cheap. Other than, that they are cute. I would just steer away from the monograms, they may or may not be centered. It's just too small, the design looked like I could have made it on my computer. The hole is too small for many ribbons. I was disappointed in how it turned out. If a person wants to spend the extra money they need to buy a larger version of the tags. These tags are a little more than just plain printable tags. They are classy and elegant. Well worth it. With the many font and design options you really can't go wrong! Will use these tags on wedding favor gift bags. So many different designs to choose from. Really unique. Used as tags on gift items for 4th grade graduation. Worked great. I used these for my son's baptism. I bought candy to put in organza bags and slipped the tag through the draw string at the top of the bag. It was adorable. The hole at the top made this convenient. I thought the printing and paper quality was good. I didn't like the quality of the string which accompanied them to tie them onto your favor. I used ribbon instead. For the price I think they could have included a niced tie. Personalized Gift Tags - Great buy! I used these as tags for my wedding favors. They looked great! The tags were surprisingly pretty and elegant. I would have loved if they were thicker and glossy however. But for its price, it was a perfect deal. I used these tied onto raffia ribbon and then wrapped around mason jars of salt water taffy for my wedding favors. They made the favors that much more perfect! WE used these tags on bamboo fans for my daughter's outdoor wedding. They looked great on the fans and were of great quality. We were very happy with our selection. I absolutely love them and will find many uses for them. I will be ordering more for my wedding and for multi-purpose uses as well. The Favor Tags are FABULOUS!! They looked so perfect on our Engagement Party Favors!! As I was working on a small budget but still wanted some wow! factor, I bought these gift tags to dress up homemade bridal shower favors for my sister. With the addition of some brightly colored ribbons, I took a simple favor and made it look professionally made! I also used them to dress the prizes so all could remember my sister's special day. The tags were sturdy, the pattern was whimsical, and it added a graphic element that could be read from across the room. I'll be sure to order more for my own wedding! Just what I wanted to add to the wedding cake candle. Tied to the bow on the packaging, it personalized it for the wedding shower. Used the gift tags for a baby shower and they were quite impressive. Everyone loved. Very dainty and fit in with table settings perfectly. It adds a very unique touch to your gift. Ordered favor boxes, ribbon and tags for my daughter's upcoming shower. Couldn't have been more pleased. Great quality and very attractive. Will be ordering additional items for the reception. Glued to the top of our favor boxes like one of the examples online (the black and white box with the red scalloped tag). Turned out great. There are holes punched in the top, but if you don't punch it out, it looks fine as a lable. beautiful, distinctive and delightful for any occasion. I bought the Bella gift tags to tie on to the wedding cake cookie favors for my daughters bridal shower and they look great!!!!! Purchase this items as party favor for bapstim party. I would highly recommend these tags! I was very pleased with the product. We received many compliments and positive comments. Cute as tags on wedding favors. But, I would order larger tags if placing the order again. I really appreciate sending a few extra tags AND some string to attach the tags! It was very thoughtful. They came out great and I am very thankful. This was a great finish to add to the mini wedding pops. Good quality and easy to attach. I ordered the largest size available, however I felt it was still too small on the wedding favor. It really would have caught more attention if it was doubled in size. I used this product for my best friend bachelorette party , on the little souvenirs. I recommend anyone to buy this product! The tags were beautiful. They really complimented the favors nicely. These will be used to stamp thank you on and attached to gift bags. These tags were beautiful and bright. They were a durable, high quality card stock, so it made it easy to use as a gift/favor topper. Very pretty with the favor boxes and some ribbon. I ordered these custom favor tags to accent the ribbon on the embossed favor boxes for a client's wedding reception by The Perfect Wedding Maui. They looked great! Bride and groom were very pleased with the quality and professionalism. The tags came fine and I will use them, but they are definitely smaller than I was expecting. These were excellent in making bridal shower favors unique. They gave a classy and elegant touch. These cute little tags just brought my whole color scheme together! 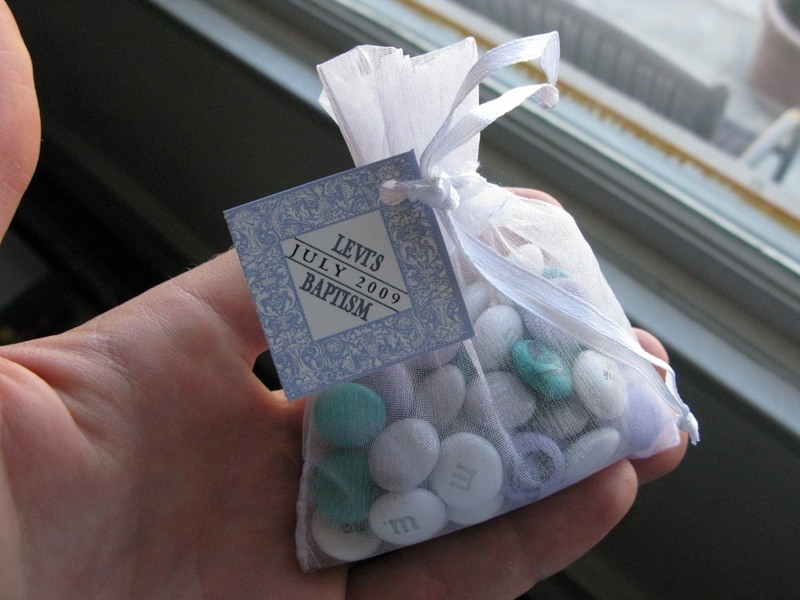 They looked really classy on the satin drawstring pouches I purchased for candy favors. These are perfect for the girls night out party for my sister who is getting married next month! I attached these tags to my party favors. They made a wonderful addition and provided the useful information my guest needed to remember when they received these. The item was a little smaller then I had hoped for. I think it would have been better if they arrived already split apart with the strings attached. Headline should have explained more uses not just for weddings... I used it for a 40th birthday favor. Could print at home for less. Labels were great for our babyshower favors! Very cute and classy! 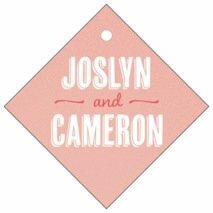 These hang tags are a very cute way to personalize your wedding gifts! These gift tags were really unique and made the bridal shower favors feel very special. What i like the most is that they looked just as i imagined. It is amazing the variety and I could wrote anything I wanted and create my own personal Favor Tags. I would definitely buy these again. These little tags dressed up the favor boxes. Added just what they needed. I used these tags for my wedding favors and love them they are perfect! I will definetly buy them for other future occasions. I used the wedding favor tags to tie around shower door prizes and gifts. Also wrapped up 2 votive candles it tulle(SP) and put the tags on as ties. for weeks I've been seaching for that little extra something for a bachelorette party gift for the other bridesmaids and the Bride. Until I found these labels. They're super cute, affordable and are the perfect touch to any gift. What especially sold me all together was that I received extra labels alongside the ones I ordered. Definitely recommend! The tags are great for anything you need to label. Looked very pretty on favors at bridal shower. tags look great! Pretty color and better looking than a lot of favor tags out there. These are really cute and add a touch of personalization to any party favor! The tags are GREAT! They're super affordable and a nice keepsake for our guests. I'm attaching them to the sandalwood fans for my wedding favor... and after the wedding, the ladies can remove the tags for their scrapbooks, and keep the fans in their purses for the summertime! These personalized tags were used on the small boxes as shown on the website. Was just the right touch of color when used with coordinating ribbon. I would definitely order these again for other occassions. Worth every cent. Purchased to use as a tag for engagement party favors. They were very elegant and added a personalized touch. These made my favors look amazing! These tag were great. They look classy and were very good quality. It's a bit hard to get the string through the hole if you have nails, but I had my husband help me. He liked them too and the price range was great! These tags are great-- the color (green) is perfect and as soon as I got them in the mail, i realized that there would be so many other uses for them! They will be a cute addition to the fans we are handing out at our wedding ceremony! I really like the tags, but I thought all of the font would be the same color. too expensive and very simple cheap product. I bought these to go with my cross votive candles by Beau-Coup. Im going to tie them to the ribbon on the box to personalize my 50th birthday party favors. They definately add a special touch and Im very happy with them. Thank you so much! I bought two different wedding favor gift tags in the same color and used them on our wedding fans (it's an outdoor wedding) as well as on our wedding favors and gifts for our bridal party. They are beautiful, worked great with a colored ribbon through them, and tied everything together really well. I will be purchasing more in the future for different occasions! The Perfect Touch for My Shower Favors! I purchased the monogram tags from Beau-Coup.com to add to the boxes for my daughter's wedding shower favors! They were the perfect elegant tags, tied to the boxes with lavender ribbon. All our guests commented on the personal touch we added to their favors. The tags arrived on time, packaged beautifully and were so easy to work with. I love unusual touches that make my special moments memorable. Beau-coup.com is a perfect resource for me. I will order from Beau-Coup again and again! Thanks for the wonderful, unusual and elegant products! 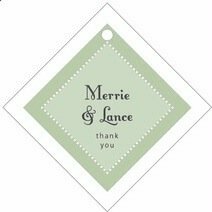 The tags I ordered were just as I expected them to be; Perfect size, the print was great and the color was bright...they were the final touch to our party favors. I bought the scallop edged "Cosmo" gift tags to go on my favor gift boxes for the wedding. The lettering and color are exactly as the site describes. Couldn't be happier! I put this tag on party favors. It was a 50th Birthday party. I used a tag with an "initial" in the background, plus the normal personalization. It added an elegant touch to the favor. These wedding tags are great. I attached the tags to the mini buri fans...they look GREAT!! they are made very well and are easy to work with! I got labels that said "Thank you" to attach to wedding favors. They added a nice touch and I enjoy them. They are a bit small. I could've ordered the bigger ones, but they were too expensive. Also the strings that came with it weren't tied in. 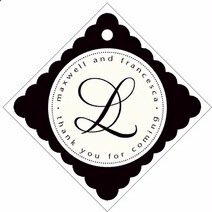 Personalized gift tags were used with a thank you gift to event planning committee members. It was a wonderful way to say thank you, and the personalized touch made it that much more special. I bought these to add to favors, they turned out nicely! Have used tags for wine gifts. Great touch. I'm pairing these with the Mini Buri Fans for our Wedding Favors - very pleased with this product! The tag was used with "thank you" on it so guests at the shower would know that the Bridge appreciated their participation. Look great! I actually used these for a baby shower after the baby was born and they added a great personal touch. Everyone was real impressed I was able to get something with such personal detail on the small budget I had. The tags and labels gave a very attractive look to my gifts. Good job!!!! I bought the tags for my daughter's Black Tie Wedding. I was worried but did not need to be. The tags were cut and printed perfectly. They are classy and look great on the wedding favors. Would buy this item again & again!! Love the femininity of design. We are using our for a label on out OOT (out of town) or welcome bags at our destination wedding. They are so beautiful I just wish we had ordered more! I purchased some of these as a gift for my sister, who was looking for tags and labels to use for canning and gifts of baked goods. We were both delighted. As a designer, I appreciated the varied designs and high-quality printing; there's no way I could replicate this quality at this price working directly with a printer. The tags arrive with white cotton string cut in about 6-inch lengths; they look even nicer when tied with raffia or ribbon. These were really cute on the favor boxes for my sister's baby shower. The only problems I had were that they didn't come with enough strings to attach them, and the strings that were present were pretty cheap looking. We were happy overall but a little disappointed with the gold color. It was flat instead of shiny. Adorable bridal shower gift tags! I attached these gift tags to bridal shower favors. Everyone loved them, especially the bride! I used as tags for my holiday party along with the silver square favor boxes. These came out better than I could have imagined! I can't wait to put them on my wedding favors and give them away. Definitely worth the money. I ordered the tags because you didn't have a label that was just black and white. I really liked the design for the tag but not any of the labels for our color scheme. These labels were used with our wedding favors and they added such a personal touch. Totally worth it! It added a nice touch! They added a nice touch to my "tea time" theme. I gave these as a hostess gift recently and they were a hit. I had their names put on these to use as gift cards for anything they deem appropriate. I used these tags for my wedding favors. But I would use them again for any type of favor I want to personalize. Baby shower, birthday party, etc. I was a nice surprise when they came, that they were such good quality and for the price. These tags were just what we wanted for our wedding favors. They look fantastic. They were perfect and were exactly what was presented online. They even sent me an extra sheet of the tags because a couple on the first page had "spots" on them (which I couldn't even see). I love the colors & font! 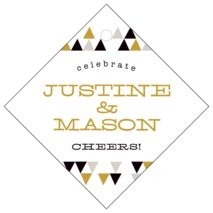 I ordered these hang tags for a rehearsal dinner. I just love them. Tastefully done & exactly what I wanted! I used these for the Mini Oil and Vinegar Bottles and gave them as favors for my wedding. It was the perfect addition since the Oil and Vinegar come with a tag of its own. I like these tags alot and will use them again. These looked great on our hand fans provided at our beach wedding! We tied these on all our favors for our wedding reception as well as the gift boxes for the out of towners hotel rooms. They were so cute. Great color selection and great ability to personalize. We were so glad we chose them. I used these cute tags for favors for a bridal shower. I bought the clear cones, filled them with m&m's and tied the tag on top of the cone with ribbons. The favors looked great! I did use it in party favors. The design was elegant and the color scheme worked well for the Bridal Shower Theme. I would consider using something similar for my child's bday party favor tag. This product was used for shower favors and wedding favors, they were easy to apply and gave a great presentation on the tables. There were many color choices to match most decors. I bought the Bella design for a shower for a bride who selected a black/white/granny smith apple green color scheme. I didn't use the thin white string that comes with the tags, used curling ribbon instead. 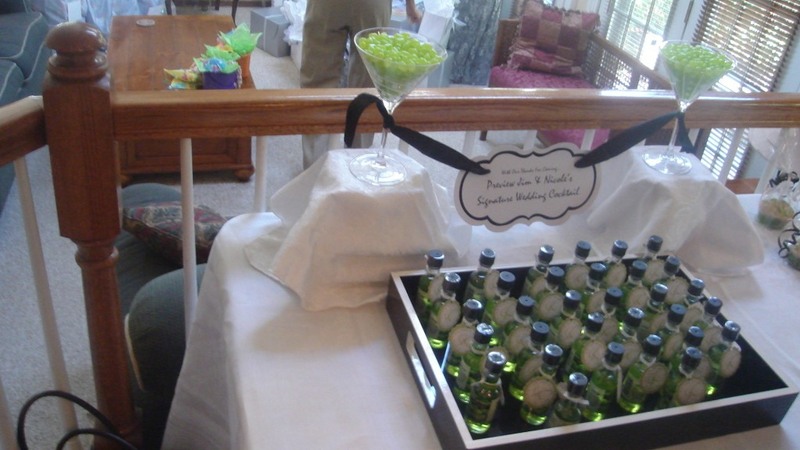 The tags were tied into mini Appletini bottles (wedding signature cocktail). The tags looked great, bride loved that they were personalized with married monogram and wedding date. They were easy to work with, didn't rip when attaching the ribbon, and didn't curl up over time. Will definitely be ordering again!!! Gift tags added just the right touch ! 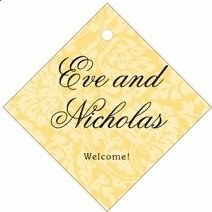 I ordered these tags to put on the favors for my daughter's bridal shower. It was the perfect touch for the gifts. My only regret was that the tags weren't double sided but that isn't a big deal. If you want to add that little something special for a gift, buy these. They are great. This product was perfect for my hand fans. It dressed them up and made them personal. The holes were a bit small to fit the ribbon through but perfect for string etc. The colors were much brighter and deeper than shown on my computer screen. Very cute! Great way to add a personal touch! I bought these tags to wrap the open heart wine bottle stoppers I bought for a bridal shower I hosted. There were so many designs, colors and sizes to choose from I felt like I was designing my own! With some toule and ribbon the tags added the perfect personalized touch to the party favor! These personalized gift tags were the perfect way to turn an everyday thing into a unique and special bridal shower favor. The quality was excellent and the tags were so easy to work with and attach with ribbon. The bride was so impressed by our personalized touch! GREAT TO USE WITH FAVOR BOXES. 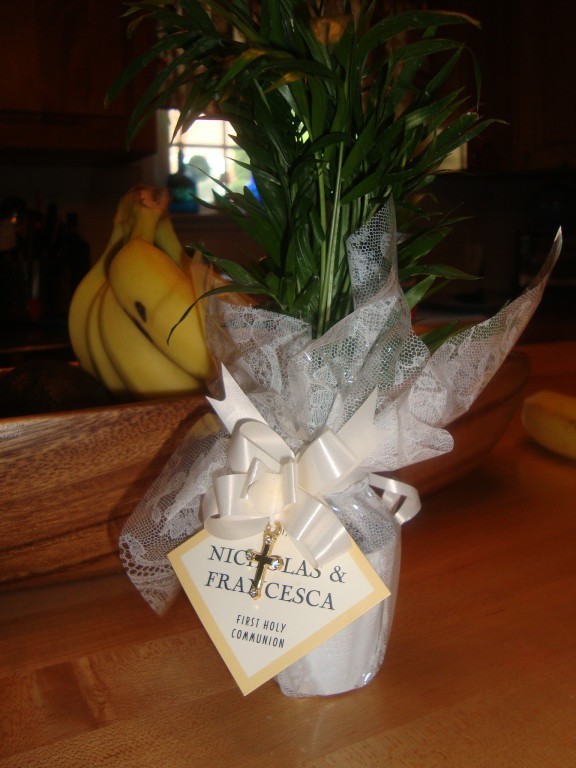 I loved this tag for my wedding favor which was the mini palm. Beautiful chocolate ribbon with the chocolate/white tag...perfect and looked classy, was practical and easy to attach to the gift! Q:I want to order the renaissance.pink.HTRE 10-39.small diamond hang tag..I just cant tell if the writing in the middle is printed in black or not? I would like it black. A:The text in the middle of the renaissance pink tag is black. 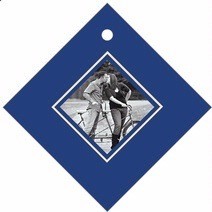 Q:Hi there, is there a way we could include our own emblem on these gift tags? The emblem is the letters of our first names in a style we really like. A:Yes, please choose the "custom" option under the designs after going into the "Customize Now" page. You can upload your custom image for no additional cost. Q:What is on the flip side of the tag: is it blank so you can write in the guest's name? A:The other side of these tags are blank. We only print on one side. A:As long as your desired text is within the text limits and fits the format of the design . For example, the cosmopolitan design would work with a date as the 2nd text line. Q:I don't want the tag to be hole-punched. Is that possible? A:These favor gift tags are pre-set to have the hole-punch included. Therefore, they cannot arrive without the hole-punch. 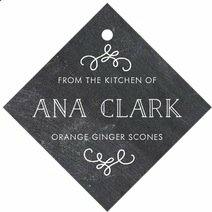 Q:Do I get a choice on the font for the gift tags I order, or do you only offer the font that is shown on that particular tag? Thank you for your help. A:The font is determined by the design that is selected. Q:Do they come with string? A:Perle-cotton strings are included with each set for your convenience. Q:How many come in a set? A:The amount of labels or tags per sheet depends on the size that you select. On the left hand side of the product page, you should see tabs labeled with the sizes. You can click on the size that you would like to order and the amount of labels per sheet will appear in red. Click on "Customize Now" to personalize and preview your design. There's nothing "in the rough" about these diamonds! These personalized diamond wedding favor gift tags add a sophisticated look to any wedding favor or diamond anniversary favor. Take your pick of sizes, designs and colors to create the perfect match for your wedding colors and theme. Then personalize tags with the couple's names and the wedding date or a special "thank you" message. Tags arrive individually cut and hole-punched. Gift tags measure either 1.25" square or 2" square. Our embossed favor bags and two-piece favor boxes both look dazzling with these hanging gift tags.